For those of you who don’t know me, my name is Andrew Osborn and I am a product guy and developer at Landing Lion. If you’re having trouble crafting, launching and tracking your web content, check out Landing Lion, and before you know it you’ll be launching Web pages in your sleep. This week we had five new (and interesting) players in the Atlanta startup scene. There was something for everyone at this week's Consumer Show, including the OCD lawn enthusiast and the UGA academic (it’s an oxymoron, I know). Blanket Homes: Luxury Airbnbs for the business traveller. | Underground Airbnb extraordinaires Trey and Jon (also founders of Blanket Homes) gave us all the insights of how to run an illegal Airbnb enterprise right out of your apartment home (I’m not going to tell you what they are; you snooze, you lose). Long story short, they managed to sneak thousands of travelers by their apartment complex leasing office before realizing their greatest enemy could be a potential partner in their Airbnb enterprise. Ironically, they reached out to partner with various Airbnb-hating multi-family apartment communities to bring the best possible Airbnb experience to their customers. What did they do really well? Trey and John spent over a year just trying to understand their core business before diving into it. Spending time both talking to hosts to identify their Airbnb pain-points and apartment communities to figure out why they resent the platform so much. This upfront effort allowed them to provide a valuable and well-thought-out service to their customers. What can the community help with? If you’re leaving town on travel to a city with a Blanket Homes presence, Trey and John would love it if you stayed with Blanket Homes (and they guarantee you’ll love it, too). They would also love for you to put up your in-town business associates in a Blanket Home in Atlanta. Here’s how it works: Blanket Homes leases unoccupied apartment homes from apartment communities with special permission to rent those homes to you on the Airbnb platform. This allows you to access your rental home as you would a hotel room, no longer having to dodge the leasing office or find your rental keys scavenger-hunt style. It also allows Blanket Homes to work out other kinks to the Airbnb experience and help you feel like you’re not just a guest in someone else’s home. But wait, there’s more! Blanket homes will also welcome you to your destination with a welcome text and instructions on how to find your very own driver (yeah, you read that right). The driver will then take you to your rental and help you get situated, and will bring to you everything you need to make your experience a great one. Think groceries, car rentals, or anything else you might want for a business trip. LawnTap: Automatic lawn maintenance services. | Imagine a world where you always knew the exact height of your lawn, no matter where you were. Instead of having to enjoy your boring vacation destination, you could watch your grass grow from your smartphone! All joking aside, if you have a lawn, an overpriced lawn care service and not enough time to call them every couple of weeks, you may want to look into Gaia from LawnTap. What did they do really well? Their on-demand service is chugging along, and they have had very few problems connecting their customers to qualified lawn care professionals. What can the community help with? They need some money! Personally, if the rest of the SDC community is like myself, they may have come to the wrong place (currently fresh out), but if anyone knows any investors looking for automated home services, send them to LawnTap. Gaia is a sensor that you put into your lawn that tracks its height, moisture, temperature and other statistics you may never need. Interestingly, though, they will automatically call a lawn care professional for you whenever your lawn reaches a certain height, all configurable from your smartphone. The best part about this service is that you pay a single flat-rate monthly fee, no matter how many times your lawn is cut. The Preferred Maintenance Plan starts at $65.99 a month, with no restriction on square feet or lawn types. If you’re extremely particular about your lawn and would like to get it cut weekly for a flat rate, this service seems like a win to me. The Gaia lawn sensor is still being pre-ordered and is slated to ship in March 2018. If you don’t want to wait for the on-demand service or aren’t OCD enough to have your lawn cut down to the inch, download their app today to instantly schedule a lawn care professional to help you avoid more chores. (1) Hiding — Stash your cyber-Monday flat screen under your doormat. (2) Pick Up — Defeat the entire purpose of online shopping by picking up your package at a local store. (3) Monitoring — Watch the thief walk away with your package while you can do literally nothing about it. (4) Enter your home — Let a stranger into your home and hope they just drop off your package and leave without stealing your package and everything else you own! Thankfully, we have Brad and Casey from BoxLock with a solution that seems to actually solve our problems, without creating more. What did they do really well? They have managed to get off the ground and get almost 500 backers in a city that is not very B2C friendly or very receptive to hardware startups. Welcome to Atlanta! What can the community help with? Solve your package theft problems by backing them on Kickstarter! Seriously, do a favor to yourself and your shopping addiction and check them out. They’ve created a lock that can fit on almost any outdoor storage solution, that will only open when your delivery driver scans a package addressed to you. To set up your BoxLock, all you need is WiFi and a storage box with a basic padlock latch to attach the BoxLock to. There is no recurring monthly fee structure for home users, and a one-time charge of $129 for the BoxLock itself. It connects to all major carriers, so you never have to be worried that the BoxLock won’t recognize your package. Guys, there are seriously no downsides to this solution. Granted, if you wanted to try really hard to think of ways it wouldn’t work, you could, but for the 90 percent use case, the BoxLock is a no-brainer. BoxLock is currently up on Kickstarter, where they also have more detailed videos so you can actually see how simple their product is. Brad and Casey also assure us that the Atlanta community will be the first to receive their much-needed BoxLocks in summer 2018. StudyHubb: Think Tinder for “study” buddies. | The StudyHubb founders presented the SDC community with the classic pick-two challenge of college (social life, studies, or sleep). They say that they have a solution that combines a well-balanced social life with academics. The app is admittedly very similar to Tinder, and allows students to match with potential study buddies at their university. It’s as simple as it sounds and has already gotten traction at many schools in Georgia, with more than 5,000 students on the mobile app. What did they do really well? They are all non-technical founders, and had to interface directly with users to create an app that people are finding useful. What can the community help with? Again, they need funding. If you know any investors who could be interested in a new study tool, send them their way! Although the founders can’t guarantee whether or not the matches are actually studying together, they do say that their app is helping students make connections ... and what they do after that connection has been made is up to them. The founders also said that the app is more tailored to schools that might not take their studies very seriously, and is not a good fit for schools like Georgia Tech (can’t say I’m surprised). Obviously, their next target is U(sic)GA, the land of less-than-serious studies, and their roll-out strategy has actually nothing to do with the concept of studying at all. The founders are planning to rent out the bars at UGA for the weekend and will only accept the downloaded app as cover. Bold strategy for a study tool, we’ll see if it pays off. If you’d like to find a study buddy for your next exam and you’re not entirely committed to actually studying, check out StudyHubb and start swiping. Fanboard: Augmented reality for sports fans. 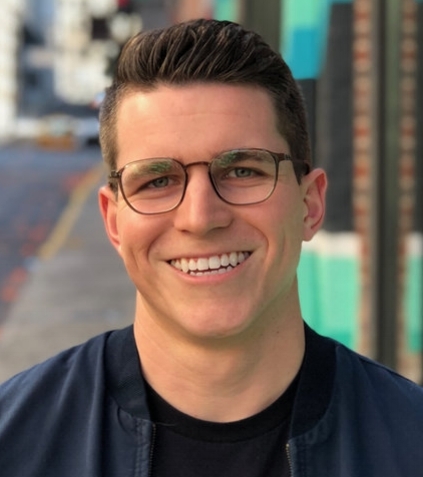 | Morgan Drake with Fanboard has pitched around the Atlanta startup community before, and it was great to welcome him to Switchyards. He came to present his solution to advertising at sports games: Fanboard. Advertisers are having trouble gaining insight into fan behaviors, have little real-time information about how their advertisements are performing, and have no clear measurement of return on investment. What did they do really well? Morgan said that Fanboard has been resilient to small failures, as it has taken them time to learn the industry. They were originally rejected by many accelerators before making it out to Boulder, and now they have office space in the new Suntrust Park. What can the community help with? Go out and support your local minor league baseball team, and use Fanboard to make your experience even better! The Fanboard native app solves these problems for advertisers by allowing them to engage with fans directly through their phones. Using augmented reality, Fanboard has created a way for fans to interact with the environment around them that is both enjoyable and gives advertisers better insight on their behaviors. Fans are now able to engage with the big screen at sports events and take selfies with mascots of their beloved teams. Although the solution was not designed for the avid sports fan who cares more about the game than their phone, they have found that it resonates well with casual fans who want the occasional distraction from the game (who can blame them, it is baseball, after all). Fanboard is planning on rolling out their augmented reality to Minor League Baseball fields, where big companies are looking to make an impression on the local footprint. They are creating white-label mobile apps for 12 teams, and plan to have them live by the next season. Switchyards Design & Development is here and they build stuff for founders. Want to learn more? Check out their announcement on Medium. 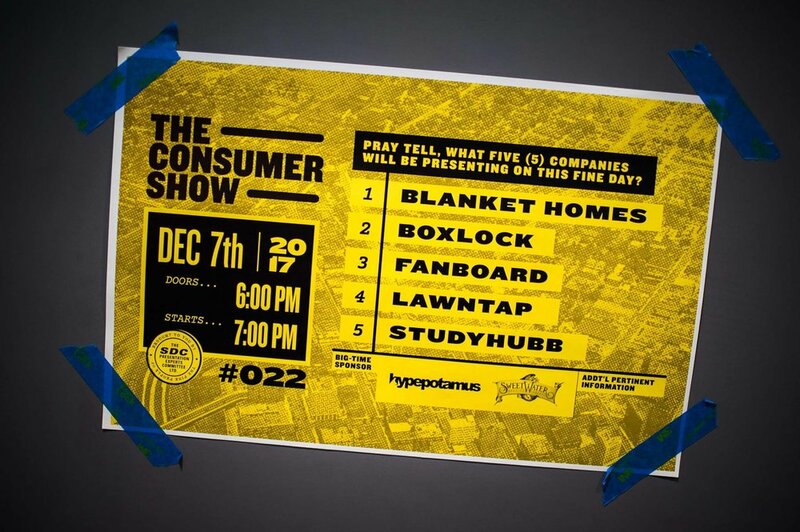 The Consumer Show 023 will be on January 4th. Check out more information about the greatest B2C startup pitch event in Atlanta at theconsumer.show and RSVP here. Switchyard’s very own Swaglanta website will be releasing one limited edition item here. Be on the lookout for December’s release coming soon! Many thanks to Andrew for jumping into the gap for a second time and doing a fantastic job with the recap! (As I told him, he writes too well and now he's my first go-to every time I have to miss. Pro/con, Andrew.) You can check out more about Andrew's company, Landing Lion, here.